32 | TH E M R EP O RT COMPANY SPOTLIGHT KEY PERSONNEL Keith Guenther Founder/CEO Michael Bull CFO Angela Hurst SVP, Business Development Rida Sharaf SVP, Real Estate Operations George Paquette Chief Appraiser STAFFING 110 employees CONTACT INFORMATION 25520 Commercecentre Drive, 2nd Floor Lake Forest, CA 92630 Phone: 949.206.5371 Email: sales@usres.com Web: USRES.com U.S. REAL ESTATE SERVICES (USRES) COMPANY HISTORY Founded in 1992, USRES has been providing the industry with BPOs for 24 years. 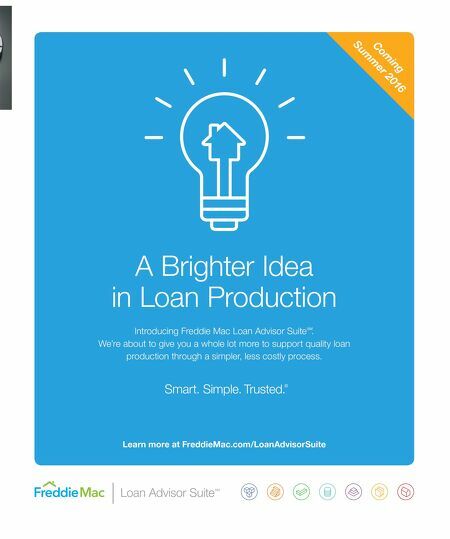 Additionally, the company serves as an industry leader for REO disposition, origination, and default valuations. USRES places equal value on technology and automation as it does on its expert staff and vendor panel. 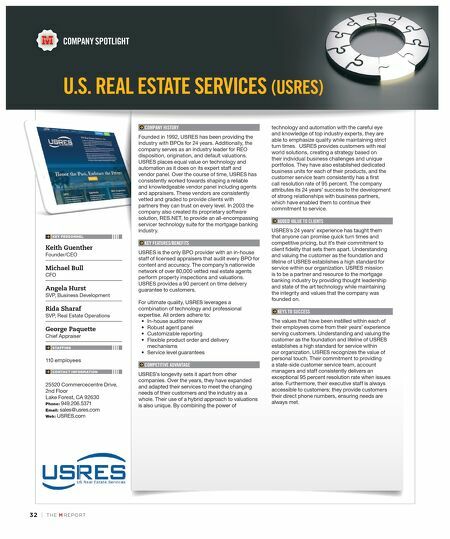 Over the course of time, USRES has consistently worked towards shaping a reliable and knowledgeable vendor panel including agents and appraisers. These vendors are consistently vetted and graded to provide clients with partners they can trust on every level. In 2003 the company also created its proprietary software solution, RES.NET, to provide an all-encompassing servicer technology suite for the mortgage banking industry. KEY FEATURES/BENEFITS USRES is the only BPO provider with an in-house staff of licensed appraisers that audit every BPO for content and accuracy. The company's nationwide network of over 80,000 vetted real estate agents perform property inspections and valuations. USRES provides a 90 percent on time delivery guarantee to customers. For ultimate quality, USRES leverages a combination of technology and professional expertise. All orders adhere to: • In-house auditor review • Robust agent panel • Customizable reporting • Flexible product order and delivery mechanisms • Service level guarantees COMPETITIVE ADVANTAGE USRES's longevity sets it apart from other companies. Over the years, they have expanded and adapted their services to meet the changing needs of their customers and the industry as a whole. Their use of a hybrid approach to valuations is also unique. By combining the power of technology and automation with the careful eye and knowledge of top industry experts, they are able to emphasize quality while maintaining strict turn times. USRES provides customers with real world solutions, creating a strategy based on their individual business challenges and unique portfolios. They have also established dedicated business units for each of their products, and the customer service team consistently has a first call resolution rate of 95 percent. The company attributes its 24 years' success to the development of strong relationships with business partners, which have enabled them to continue their commitment to service. ADDED VALUE TO CLIENTS USRES's 24 years' experience has taught them that anyone can promise quick turn times and competitive pricing, but it's their commitment to client fidelity that sets them apart. Understanding and valuing the customer as the foundation and lifeline of USRES establishes a high standard for service within our organization. USRES mission is to be a partner and resource to the mortgage banking industry by providing thought leadership and state of the art technology while maintaining the integrity and values that the company was founded on. KEYS TO SUCCESS The values that have been instilled within each of their employees come from their years' experience serving customers. Understanding and valuing the customer as the foundation and lifeline of USRES establishes a high standard for service within our organization. USRES recognizes the value of personal touch. Their commitment to providing a state-side customer service team, account managers and staff consistently delivers an exceptional 95 percent resolution rate when issues arise. Furthermore, their executive staff is always accessible to customers; they provide customers their direct phone numbers, ensuring needs are always met.